Whilst I think there is a certain justice in imposing additional fines on those who embark on a clearly abusive scheme, I’m not sure a distinct regime for the GAAR would be effective. The GAAR is primarily a deterrent, often described as an electrification of the fence. It is supposedly there to catch the minority of schemes that are surviving challenge under pre-existing legislation and principles developed through case law. With the prevalence of anti-avoidance legislation and, for example, the recent resurgence of Ramsay through the firm adoption of Ribeiro PJ’s apothegm from Arrowtown, the chances of success are already low. That low chance of success is cut down further by the threat of the GAAR and in one sense, that is all it need do to be effective: cut down the perceived chance of success. The investment of time and resources into testing a scheme through the courts is already a significant disincentive to most, let alone the reputational damage that accompanies the public pursuit of defending artificial and abusive arrangements. I have no problem with trying to increase the disincentive, but somebody who is currently contemplating taking on the GAAR is already highly likely to not be easily disincentivised from adopting abusive arrangements. Therefore, the main benefit in a separate penalty regime seems to be the punitive element, to my mind, rather than to increase the warnings surrounding our electric fence. I have no issue with that rationale either but on the deterrent point I think the additional disincentives might be outweighed by the potential incentives that it creates. Where a scheme might appear to fail by the GAAR, a harsher penalty regime creates an incentive for HMRC to use the GAAR over other methods. There will always be public and political pressure to administer increased punishments for aberrant behaviours. Will future HMRC inspectors worry about whether the PAC will ask why higher penalties were not sought by applying the GAAR? I think it’s important to remember that the GAAR is primarily designed as a deterrent. To my mind, a deterrent that is called into action has failed in that instance. Anything that encourages systematic use of a deterrent seems rather counter-productive. Of course the deterrent does need to actually work because it needs to be seen to be effective. I imagine HMRC will carefully pick test cases to that end. But we do not want the deterrent being used too often. One of the GAAR’s key attributes as a deterrent is uncertainty. That needs to be preserved as much as possible. The more instances in which the GAAR is tested, the more certain we become over its scope. And the more certain we become of where its reach fails. To push the electric fence analogy to breaking, quite literally, do we wish to encourage HMRC to publicly test our fence for weaknesses simply to sate our appetite for watching trespassers get electrocuted? Finally, there is potentially an incentive for the taxpayer who is caught by the GAAR. Facing stiffer penalties might make them more likely to challenge the effectiveness of the GAAR in order to reduce their penalties to the level attached to other, “normal” measures. This appears slightly contrary to my earlier point about the lack of disincentive to test the GAAR, but to resort to the electric fence analogy yet again, I’d point out that the incentive of escaping the pain of the electrocution is not the same as the disincentive given by the warning signs once your hand is on the wire. However, if the penalties were exactly the same for being caught by any other method, what incentive would there be to struggle against the GAAR specifically? Ultimately, if we simply want to punish more harshly abusive behaviour, I think we ought to amend the entire penalty regime so that abusive behaviour is punished more harshly irrespective of the mechanics of how the arrangements fail to operate as intended. I’ve seen a bit spoken about “tax risk” recently. It seems to me that there is a bit of chopping and changing over what is meant. Just for reference, here is what I reckon is meant by the term. I tend to think of tax risk in the form described in Wikipedia as ‘expectation value’ or ‘risk factor’. In my earlier post, I suggested that there was some dodgy use of data in Richard Murphy’s latest report. 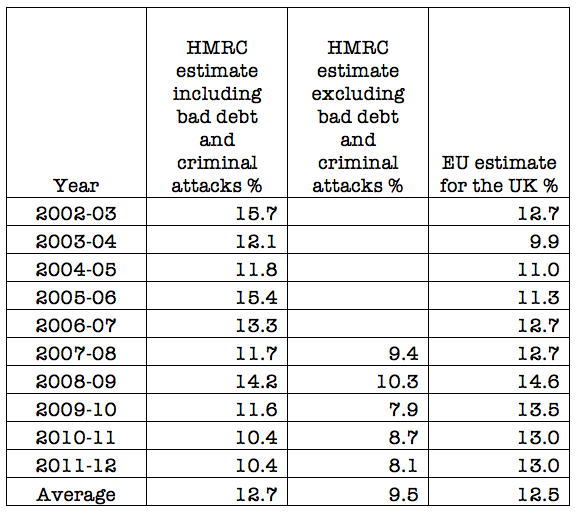 Now, the EU forecast in figure 26 still includes bad debt and criminal attack. So without any analysis of what that number is, he appears to adopt it as a proxy for the VAT gap excluding bad debt and bungs it in. 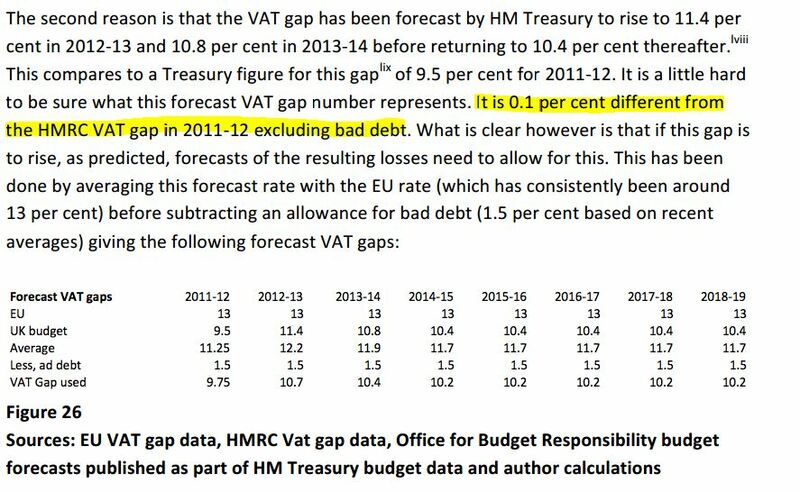 If he is using the Treasury figure as a proxy for the VAT gap less bad debt, then he’s already taken off bad debt in reaching that 9.5% in 2011/12. Or, at the very least, it is almost a figure that is the VAT gap less bad debt. Now look at the fifth line of figure 26, “ad debt”. That 1.5% relates to the average bad debt from HMRC’s data for the previous five years. The 9.5% already excludes bad debt. Richard is double counting bad debt against the UK budget figure when he removes it from the average.. So the numbers that he pumps into the third line of the next table, figure 26a are wrong. Effectively, the VAT gap used in 26a is an average of HMT’s VAT gap including criminal attack (criminal attack won’t correlate to unrecorded sales) but excluding HMRC’s bad debt and the EU VAT gap including both criminal attack and HMRC’s bad debt, with HMRC’s bad debt taken off the average. 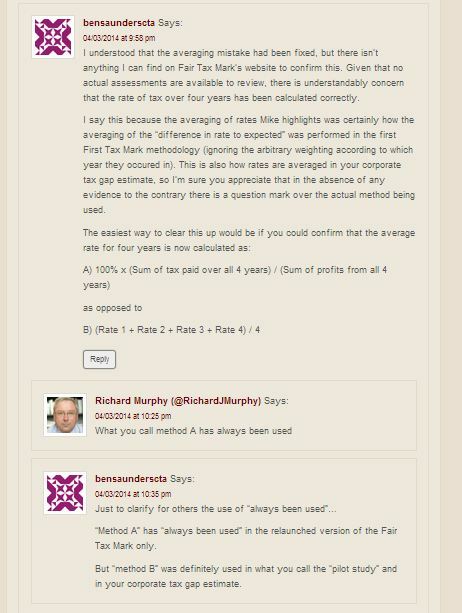 Now, going back to the alternative, if Richard is not using HMT’s figure as a proxy for the VAT gap less bad debt, then he is using a dataset that he has no idea what it actually relates to. Either way, those calculations are a complete waste of space. The two sets shows “very different” trends? But they “strongly agree”? 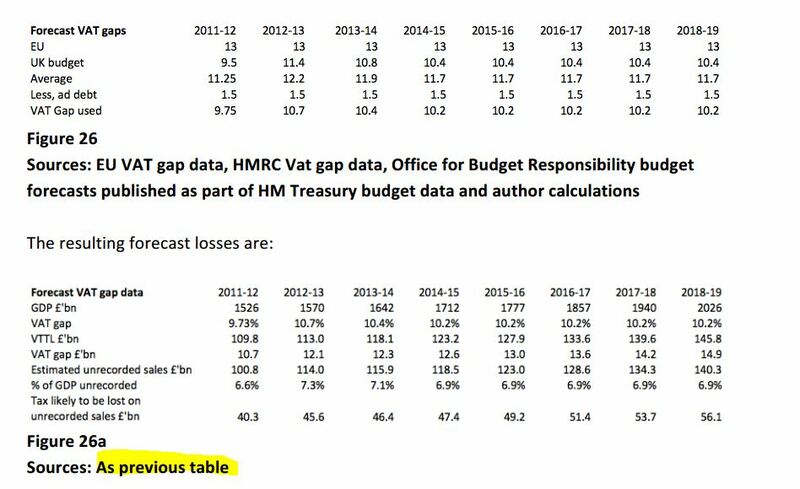 Given that overall the two strongly agree I took the HMRC data for VAT lost to criminal attacks and bad debt off the EU estimate then averaged the two over five years to come up with my estimate as a base for projection of 9.7%. HMRC may say that’s wrong: I would suggest it’s fair use of data. I think the likely result from doing so statistically appropriate. Right… Just the entire basis of his calculations…. To be fair, I think he’s talking about agreement in overall magnitude as opposed to difference in trend. But I think that when one data set suggests that the other is overstated by as much as a third in some years and understated by almost a third in other years , I would really think about providing some actual evidence before declaring that they “strongly agree”. But let me go back to Nick James’s point: whilst the law is as it is you sometimes have to do things that definitely comply with it whether you like it or not, because that’s what necessary. It would be wholly inconsistent to endorse the above statement if you were to have a go at a company that applied, say, an arm’s length price using the exact same terms it applied to independent third parties. I think it’s fair to say that it is indeed hypocritical if you were to stand behind that statement and then imply that necessary tax compliance actions following a commercial decision to, say, centralise European operations (such as coffee bean purchasing and roasting), were in any way tax avoidance or, even, “immoral”. And those two things aren’t even a favourable comparison for Richard’s defence of the EIS issue. Transfer pricing is a mandatory requirement whereas EIS is an optional relief. I mean, you have to impute an arm’s length price, there’s no choice about that. HMRC would tear you apart if you didn’t. But you certainly do have a choice whether to apply for the Enterprise Investment Scheme. Maybe it is purely a moral choice, as opposed to a legal one, eh? Nobody that I’ve seen is really accusing the Fair Tax Mark of tax avoidance. That’s a straw man argument from Richard and he must surely realise that. People are just pointing out that if Richard consistently applied his own arguments and principles, he would not conclude, as he readily has, that many of his previous targets were avoiding tax by complying with the law in the manner it was intended. Many people trust accountants. Therefore, they are demonstrably capable of being trusted. I always thought that Chancellors were supposed to make the most of cuts whilst glossing over rises. Instead, George Osborne, managed to get a tax cut recognised at a quarter of its value. It’s actually a 4p reduction on what it was supposed to be. Most of the people I have seen who are criticising Fair Tax Mark from within the accountancy and tax professions I believe want to see the public better informed about taxation. That is my opinion and I can only vouch with certainty for myself. To declare my interests, I work for a legal information provider. The way I see it, the more interest in taxation, the bigger our market is. I believe that many of the current problems arise from misunderstandings, a lack of information, over what is intended by the tax system and how it achieves that. I think that people being better informed about taxation will allow us to have a better discussion about what our tax system is designed to do, and what it should do in the future. I think that it is clear that my criticisms of the Fair Tax Mark are technical in nature. And my main concern is that the Fair Tax Mark is too simplistic. It is simply not possible to guarantee that a business pays ‘fair tax’ on the basis of corporation tax transparency alone. Corporation tax transparency is part of ‘fair tax’, but it not its entirety by a long way. In fact, I have only seen arguments for a less informed public from proponents of the Fair Tax Mark who have argued that people just want to boil down tax behaviour to a pass or fail. As such, I think your fourth point is incorrect. Most critics I have heard have made it clear that they have no issue with increased transparency over corporation tax, which is what the Fair Tax Mark method actually measures. Indeed, most critics appear to be openly in favour of increased transparency and better understanding of taxation. I can’t see why they wouldn’t publish it. As I tried to explain elsewhere, listening to criticism is very important. Is the Fair Tax Mark mathematically sound this time? Method B was used to average the difference in rate to expected rate average. I have removed the arbitrary annual weighting from the averaging to highlight the principle in question. I have tried to find out if there is any legitimate use for Method B. I cannot find an accepted use other than as a shortcut where the denominator in the rate is identical (ie you get the correct answer only if Profits 1 to 6 are identical). Now, at present, it is not clear from the Fair Tax Mark’s criteria whether they are correctly calculating an average rate this time. So I asked Richard Murphy on Andrew Goodall’s blog which covered this point. Richard, as yet, hasn’t corrected me on my clarification so I assume that he is unable to disagree. So it appears that the Fair Tax Mark is mathematically sound this time. But the significance of this point is that both the original Fair Tax Mark and that corporate tax gap estimate contain Method B in their workings (which are both cited on the Fair Tax Mark website). If you accept that Method B is fundamentally flawed, you have to accept that the corporate tax gap estimate here in Appendix 4 is fundamentally flawed. And I cannot see how you conclude that Method B is not fundamentally flawed. There appears to be a little confusion over what HMRC’s guidance on Bitcoin means. The most obvious thing to notice that it is a VAT Brief. So it is primarily aimed at stating what HMRC’s practice is for interpreting UK and EU VAT provisions in relation to Bitcoin. One of the purposes of such guidance is so that taxpayers can show reasonable care by taking into account HMRC’s view. I don’t think you can reasonably read any policy decision by the UK government into the statement. It is just HMRC explaining its view of existing law. But HMRC does go to the effort to lay out briefly the tax treatment, stating that normal principles apply. So it seems the natural conclusion that Bitcoin mining would be treated as a trade if it fulfils the badges of trade. Any significant profits created in the UK through mining would almost certainly meet that criteria. Other increases in value achieved through Bitcoin are subject to normal rules. So businesses using Bitcoins as currency could find out HMRC’s view through the Business Income Manual, such as here. Obviously, as with their statement on VAT, HMRC are trying to explain how the current rules apply to Bitcoin. They are not making any statement of policy on behalf of the UK Government. Indeed, the Chancellor is going to deliver the Budget very shortly, so I would expect any policy decisions regarding Bitcoin to be included there.